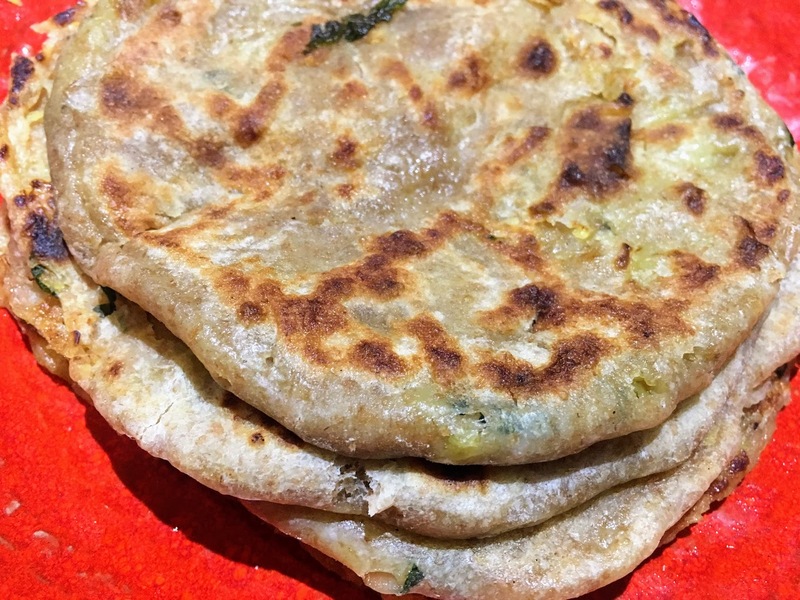 Parathas, flaky, griddle-cooked flatbreads, are a popular breakfast food in South Asia. They’re especially delicious stuffed with potatoes (aloo) and spices. My mother-in-law taught me how to make aloo paratha the traditional way, but I decided to put my own twist on the recipe, swapping potatoes for sweet, starchy Japanese yams. 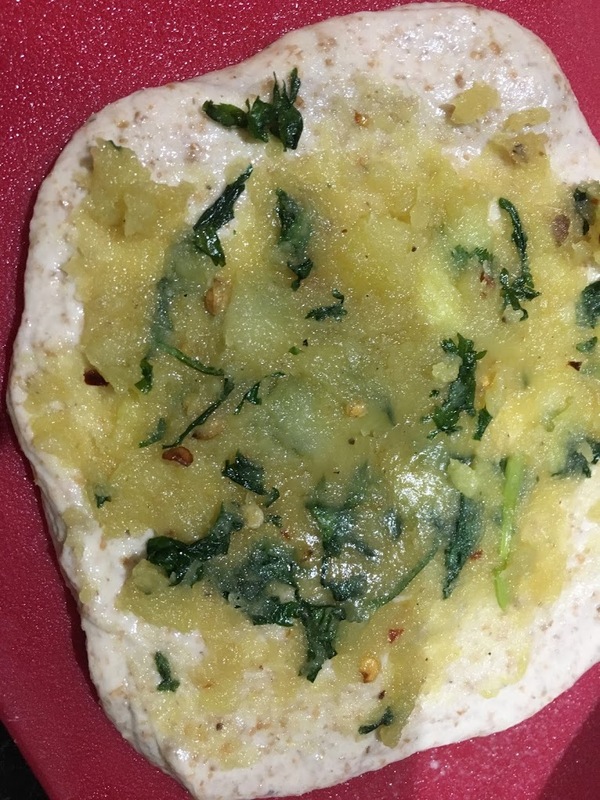 I added two common ingredients in South Asian cooking -cilantro leaves and coriander, the seeds of the cilantro plant – to balance out the sweetness. These come out best cooked on a tava, a concave griddle designed for cooking flatbreads, but a cast-iron pan is the next best option. Note: Whole grain flour made with einkorn, an ancient variety of wheat, is available online. I find it lighter and more flavorful than commercial brands of whole wheat, but feel free to use conventional whole wheat flour in a pinch. Prepare the dough: In a medium bowl, combine flours and salt. 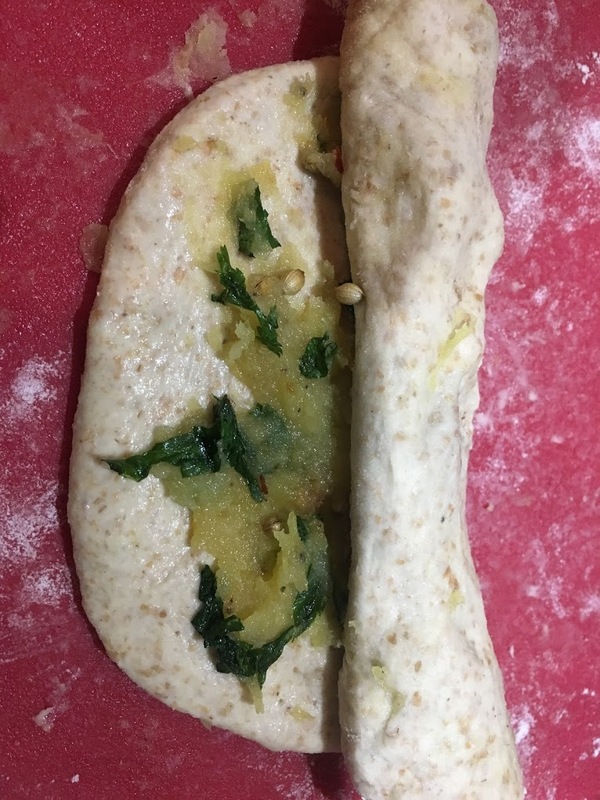 Stir in water with a fork or your fingers until a soft dough forms. Transfer to a lightly floured surface, and knead until smooth and elastic, around 10 minutes. Return to bowl and cover with a towel. Set aside for 10 minutes. Prepare the filling: Heat olive oil in a sauce pan over medium flame. Add coriander seeds, salt, and red pepper flakes, and cook for about a minute or two, stirring frequently, until seeds become toasted and fragrant. Add mashed sweet potato and stir until blended with the oil and spices. Cook for a few minutes. Stir in cilantro leaves, then remove pan from heat. Set aside to cool. Assemble: Divide dough into 6 equal-sized pieces. Roll each piece into a 5-inch disc, and evenly spread just under a tablespoon of filling over the surface. Roll up as if forming a jelly roll. 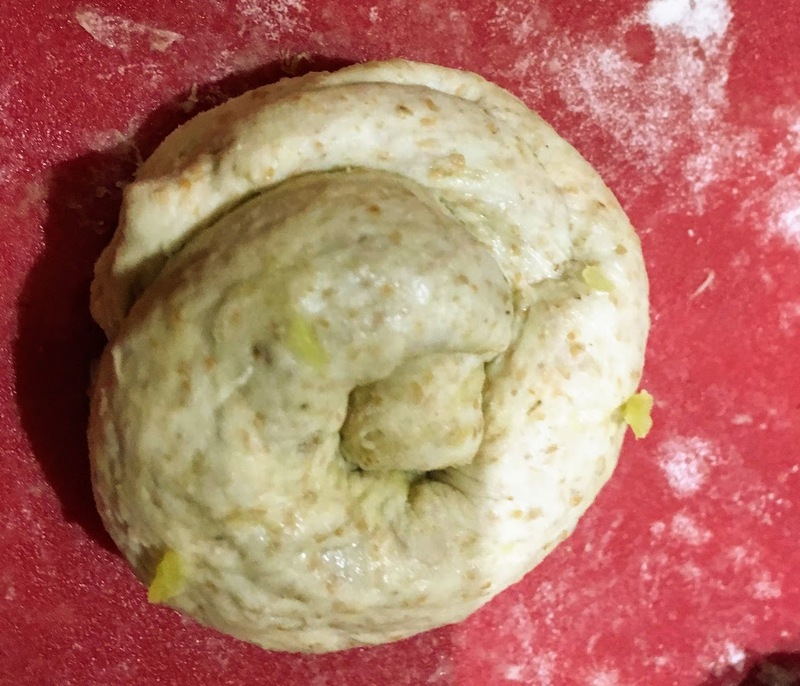 Stretch and elongate the rope of dough by rolling it with the palms of your hands, then twist into a spiral, tucking and pinching the end underneath. Lightly coat each side with flour, and using a rolling pin, flatten into a disc around 1/4 of an inch thick. Cook: Heat a tava (concave griddle) or cast-iron pan over medium-high heat. Brush the top of each paratha with 1 teaspoon olive oil. Place, oiled side down, on tava. Cook until reddish-brown spots begin to form underneath, around 2 to 3 1/2 minutes, depending on how hot the griddle is. You may also notice air pockets forming, causing layers of dough to separate and puff up. Just before flipping, brush a teaspoon of olive oil on the surface. Flip over and cook until spots appear on opposite side. Remove from heat. Wrap in tinfoil until ready to serve. Store leftovers in the refrigerator.